The Nintendo Switch has become a haven for indie titles, bringing games that were long sequestered on PCs to living room – and on the go. This goes for games with RPG elements and those without. Perhaps one of the biggest genres to make a splash on the Switch is the roguelike – games with procedurally generated levels, drawing random elements from a pool and mashing them together to create a unique experience each time you play. These games typically come with some level of RPG influence, whether they be light or heavy-handed. 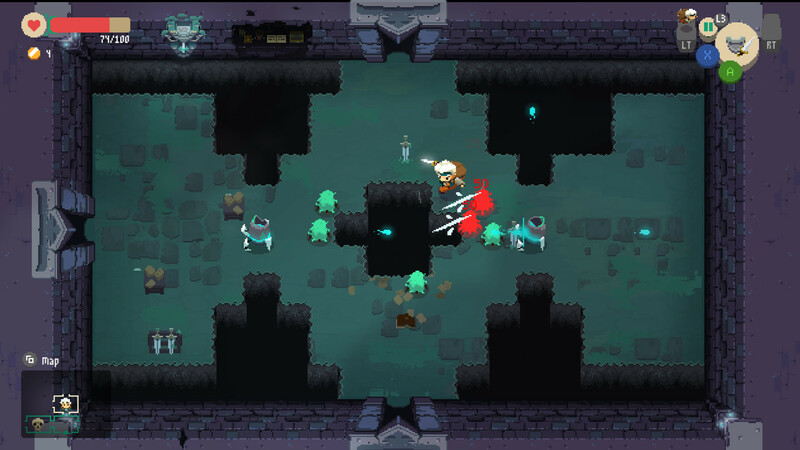 In the case of Moonlighter, we find an action-RPG / shopkeeping simulator combo, inspired by the likes of the Legend of Zelda, all rolled up into a single roguelike package. 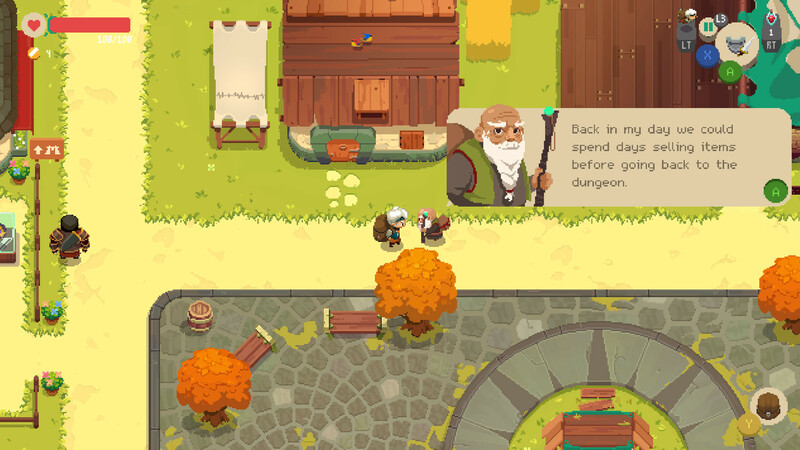 Moonlighter follows the adventures of a young merchant – the latest owner of a shop with the same name – who lives in a unique village nestled on the outskirts of a mysterious series of dungeons. Long ago, people discovered that they could venture into these dungeons, slaying monsters and gathering treasure, only to return later to find the dungeon changed. Never the same the second time, these dungeons provided an unlimited amount of resources to those who ventured into them – providing they can survive its perils. Four of these dungeons were once open to heroes and merchants alike – and a fifth dungeon was rumored to exist – but eventually the deaths piled up, the gateways to the dungeons were locked, and the little town dwindled into obscurity. Now, our merchant begins setting off into the dungeons once again, discovering their secrets, unlocking long-closed gateways, and building up the little Moonlighter shop (and the village that surrounds it) into prominence once again. Beyond this simple premise, the story of Moonlighter is mostly told through short dialogues with the elder of the village, alongside small, scribbled notes left behind by dead adventurers, whose bodies and campsites can be found inside the dungeon. Through these notes, the player slowly learns more about the nature of the dungeons, discovers additional means of finding treasure, and eventually, can learn just how these dungeons and the secrets inside came to be. It’s a unique form of storytelling that plays perfectly into the game’s procedurally generated gameplay. If any criticism can be made, it’s that there isn’t nearly enough variety in the notes associated with any given dungeon. After a few runs, you’ll find yourself skipping them entirely. The dungeons themselves are clearly inspired by the original Legend of Zelda. Featuring simple rectangular rooms, with potential doorways on each side, each room features a randomly selected layout and set of enemies drawn from the bank of the given dungeon. Like the notes that can be found, there isn’t a huge amount of variety in these layouts, and you’ll quickly find yourself recognizing rooms after only a few runs through a given dungeon. That being said, the creative use of walls, pits, and other hazards keep the gameplay varied enough to stay engaging, even after dozens of dives into the same dungeon. In addition, each dungeon is made up of several floors with progressively harder enemies, giving you a sense of progression as you make each run. To gather precious loot, players must fight their way through hordes of monsters found within the dungeons. Each of the game’s dungeons has their own bank of unique enemies, along with a few similar touchstones that help give a feel for the kinds of hazards you may face within. To fend of these beasts and gain the treasures they protect (or to harvest their body parts for profit), the merchant is armed with swords, spears, bows, and other weapons that each have their own strengths and weaknesses. Bows do low damage, but allow you to attack from a safe distance. Swords swing in a wide arc, allowing you to stand outside the direct line of fire to attack. In addition, the game implements a simple rolling mechanic to dodge and weave between enemies and their attacks, which can create some truly frantic moments when the right horde of monsters come calling. Perhaps the most underdeveloped aspect of Moonlighter are the bosses that appear at the end of each dungeon. You must defeat each dungeon’s boss in order to unlock the next, and each of the bosses offer varied attack patterns, forcing you to use all the skills in your toolkit to succeed. I found myself satisfied with the challenge each boss presented, but wholly disappointed with the fact that I couldn’t battle them again when I returned to their room later. This strips a layer of variety found in many other roguelikes, and is sorely missed here. Once you’ve filled your bag with loot to your liking, you can return to town to sell your wares at the eponymous Moonlighter. 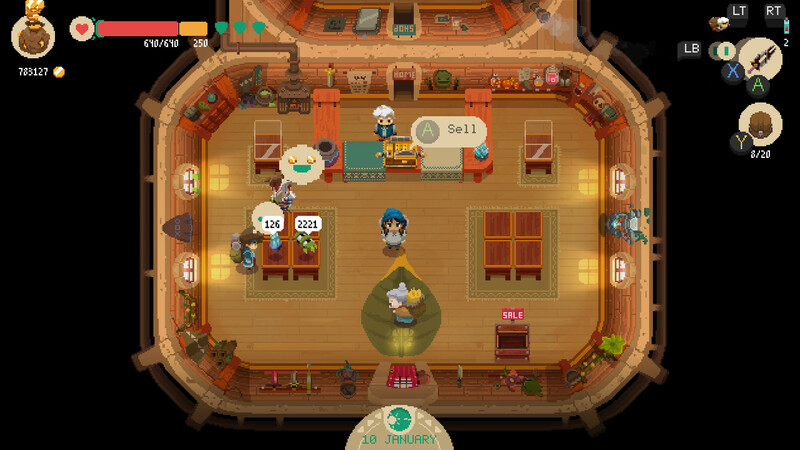 The player must place treasure around his shop, setting prices as he sees fit, and see what his customers are willing to pay. The customers who wander the shop will signal if they are pleased with a price, and show when a price is over or under valued. It takes some trial and error at the beginning of every dungeon to find the right prices, but in time you will find your groove and be selling treasure at high speed. The customers who visit Moonlighter bring quirks of their own. A few patrons will enter the shop signaling that they are looking for weapons and armor, and others will try to sneakily steal some of your wares. Players must constantly monitor their prices, customer satisfaction, and the potential thieves to keep their shop running smoothly. As the game progresses, the kind of customers you may receive will continue to diversify, including a few easter egg patrons who resemble famous gaming icons. As your fortune grows, you can stop by the notice board in the center of town to purchase upgrades to both the Moonlighter shop and invite additional merchants to set up shop in the town. These include an armory, where you can trade rare materials from the dungeon for more powerful weapons and armor, a shop to purchase potions and enchantments for your equipment, and several others. Shop upgrades include increasing your storage capacity, buying new cash registers to increase “tips” from customers, and upgrading the size of the shop itself to sell more treasure at any given time. One key upgrade that comes with one of your shop upgrades is the ability to take on quests from your patrons. Customers will come to the counter asking for specific items from the dungeons, giving you a deadline within the next few in-game days before they return. This review has convinced me to buy it now! I will definitely be getting this is the future! Great review!